Yesterday's honesty experiment, conducted in cities across the U.S. by local iced tea company Honest Tea, has good news -- if you live in, um, somewhere else. That's because 99 percent of those folks paid for their drinks, even though they didn't have to. But here? Meh. The District (the second most honest city in 2010) has ended up all the way down in 10th place this year. Oh, how the mighty have fallen. It may not be as bad as it sounds. The District only dropped two percentage points, from 93 percent to 91. But other cities have clearly become more honest. In other words: It's totally not our fault, OK? 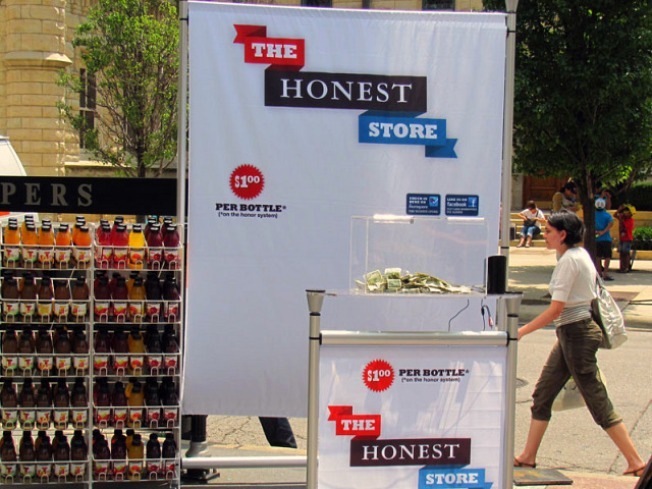 So here's how it all worked: Honest Tea measured honesty rates by setting up drinks at unmanned pop-up shops in different cities, with video cameras to monitor activities. There was no penalty for those who decided not to pay the $1 for their drinks -- except, perhaps, for the veil of shame that's now been lowered over our city, as well as Los Angeles (88 percent honest) and New York (86 percent honest).